Nurit Zarchi was born in Jerusalem in 1941 and grew up at Kibbutz Geva. She studied psychology at the Hebrew University of Jerusalem and later literature and philosophy at Tel Aviv University. Zarchi has worked as a journalist and holds creative writing workshops for children and adults. Zarchi has published novels, short stories, poetry, a collection of essays and over 100 books for children. 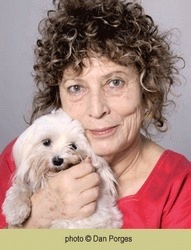 She has received every major Israeli award for children and youth literature as well as for her poetry, including the Prime Minister's Prize twice (1980; 1991), the Ze'ev Prize (five times), four IBBY Honor Citations (1980; 1984; 1998; 2004), the Bialik Prize (1999), the Education Minister's Prize for Lifetime Achievement (2005) the Amichai Prize (2007), the Ramat Gan Prize (2010), the Lea Goldberg Prize (2011), the Landau Prize for Poetry (2013), the Devorah Omer Prize for Lifetime Achievement (2014), the Arik Einstein Prize (2015) and the Israel Center for Educational Innovation Award for Lifetime Achievement (2016).